Suddenly it struck us! 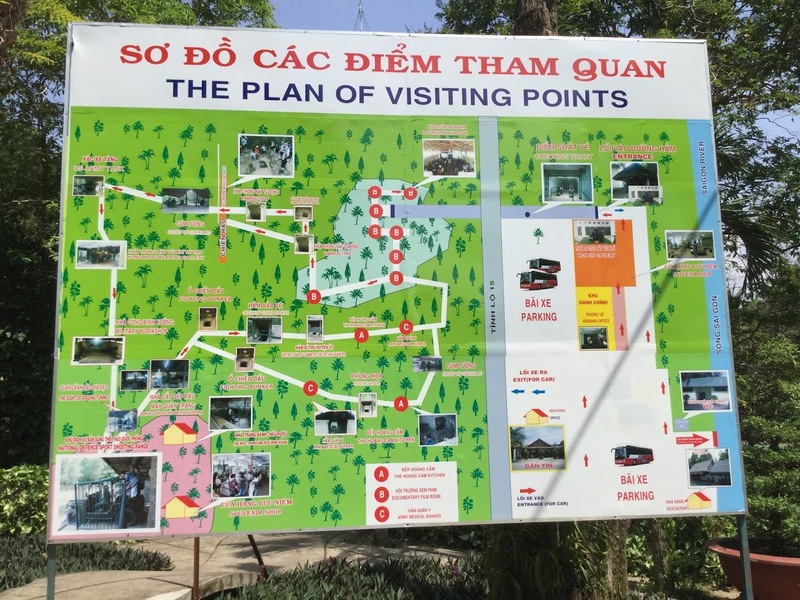 One more country to explore – Vietnam – and then our six-month journey would be over! We had one Big Question … Where had the time gone? 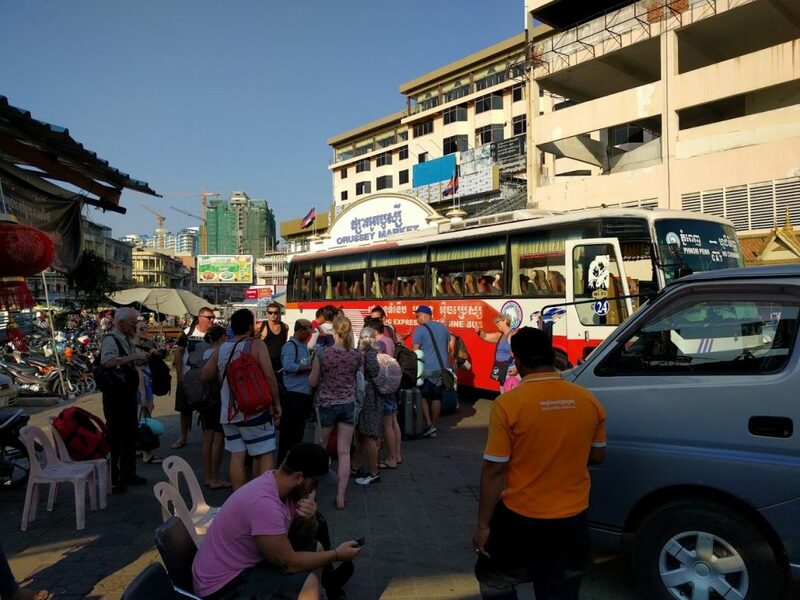 We traveled from Phnom Penh to Ho Chi Minh City by bus, a journey that takes about seven hours. Two different bus companies drive this route and the one we chose was OK but Bill found it very cramped. One reason for our decision was that there was an English-speaking Tour Guide on board who would give commentary along the way. It was helpful that he spoke English at the border crossing but we only had two brief announcements enroute! The journey was uneventful and the border crossing, which took about an hour, went smoothly. The first thing we noticed was the Hammer and Sickle flag flying next to the Vietnamese flag. The brilliant color is quite eye-catching and reminded us that – Yes – we were in a Communist country! By now our arrival time was delayed an hour and our Airbnb Hostess was meeting us at the bus station so the guide kindly phoned her with the new arrival time. Expecting a regular bus station, we were taken by surprise when the bus drew alongside a Park and bags were unloaded (actually more like ‘dumped’) on the sidewalk! With the help of our hostess and a friend of hers, we retrieved our bags and walked across the park where she called for a “Grab Car” (more on this later) to take us to her home. We were in store for a very special welcome to Vietnam! We had booked the Airbnb for three nights, with plans to move on to a guest house or hotel after that. 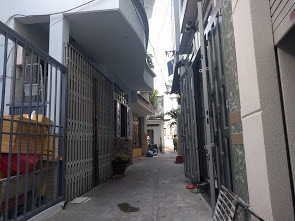 Our hostess decided to meet us at the bus station because her house is located in an alley away from the center of the city and, knowing that we were ‘older’ she felt that we would have a difficult time finding it. She was right! The car left us at a point where the road narrowed so only scooters and pedestrians could navigate! We continued on foot for some four minutes turning right and left several times down the alleys until we came to her lovely, new (3 months old) house. She served us tea and cake then told us to go upstairs and rest until dinner was ready. This is not part of the service of a B&B and we felt very spoiled! That evening we enjoyed a delicious home cooked meal and slept soundly in a very comfortable bed. We immediately felt at home here in Ho Chi Minh City. Not surprisingly, we bonded quickly. 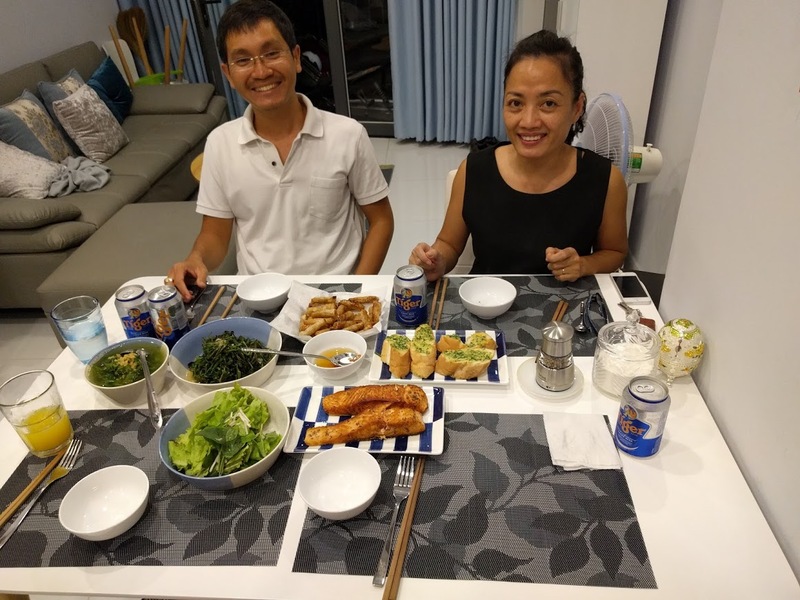 Our hostess spoke perfect English and has worked at upscale hotels in Macau. She is married to an American who is currently in the U.S. She and her friend helped us get a Sim card for the cell phone and explained how the Grab Car system worked. Grab Car is similar to Uber and a little cheaper than a taxi. When you order it you receive the plate number of the car on your phone and also have to confirm with the driver. This proved a little difficult for us since most of the drivers speak no English. We did use Grab Car on a couple of occasions but had to get help from other people due to the language barrier. The cars looked brand new and were spotlessly clean! Using their GPS they can get you wherever you want to go. You can also use Grab Bikes (scooters) to get to your destination but we decided not to try this! We were pleased to learn that our room was available for additional nights so set about exploring and doing some sightseeing. We quickly became familiar with the neighborhood and spent time in different coffee shops – just like the locals! There was so much to see on the streets and sidewalks of this hectic, noisy city! 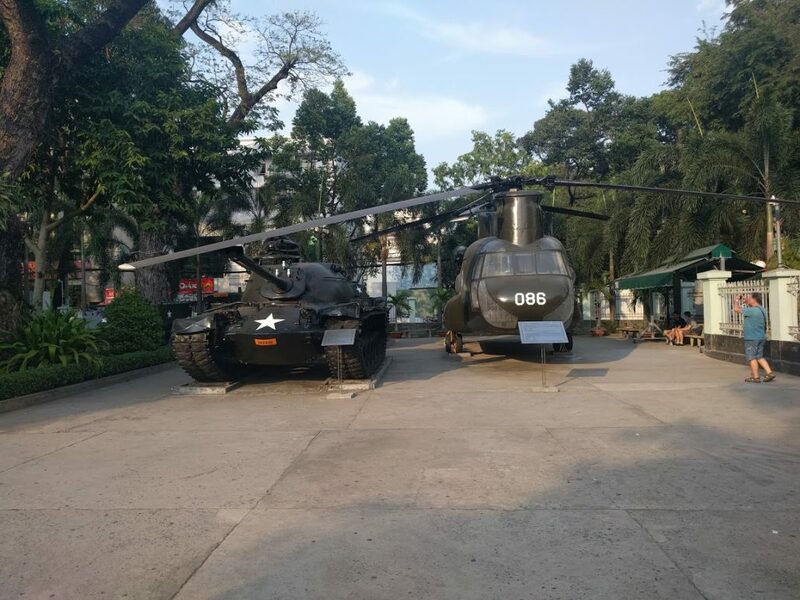 When in Ho Chi Minh City we think it’s important to visit to the War Remnants Museum https://en.wikipedia.org/wiki/War_Remnants_Museum (originally named The Museum of Chinese and American War Crimes). Be prepared for a one-sided view of the war, known here as “The American War”. The horrors of the war are shown in displays of weapons and vehicles used, as well as photos – some of them from Life Magazine – and with which you are probably familiar. Many of the photos are graphic and moving, in particular photos of the results from the use of Agent Orange and cluster bombs. 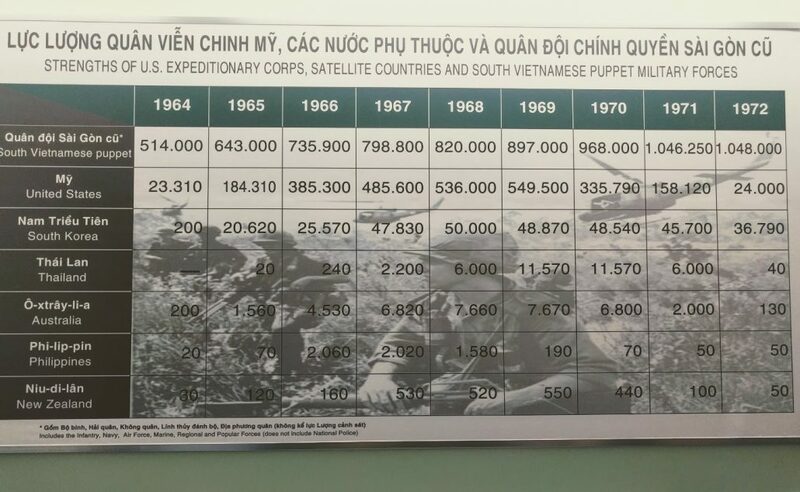 Obviously both sides of the conflict were guilty of terrible acts, however, the actions of the Viet Cong are not covered at this Museum. 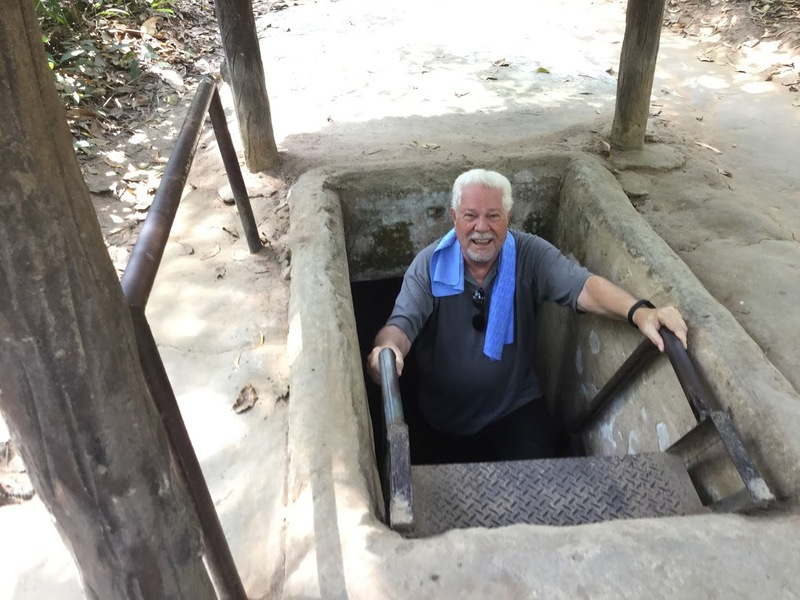 Taking package tours is not our favorite way to travel, however, it is the best way to get to the Cu Chi Tunnels, some 29 miles (46.2km) from the city. We decided on VietFun Travel for the tour and were at their offices across town bright and early for an 8am departure. After stopping at a couple of hotels to pick up other passengers we threaded our way through heavy traffic to the outskirts of town. Our guide was very pleasant, quite funny and did a good job explaining the history of the city. The bus was modern and clean and the drive was comfortable. 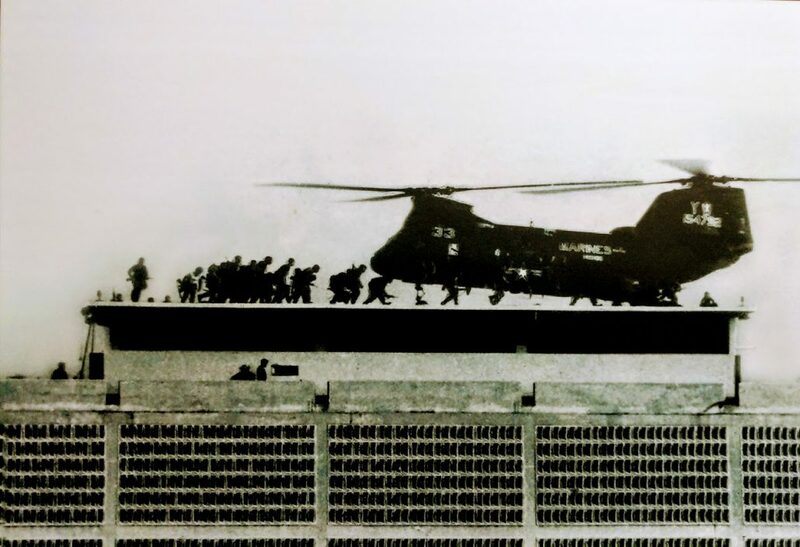 A short black-and-white propaganda video was shown on the way showcasing how the people of the region fought against the aggressors – the Americans. One look at the parking lot at the Cu Chu Tunnels and we knew the crowds would be huge! 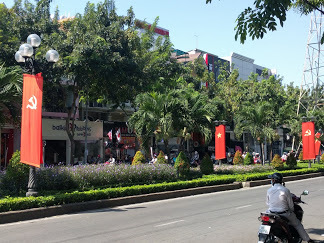 Two large groups of students from the International School in Ho Chi Minh City were waiting to get tickets and we soon found tourist groups milling around with tour guides talking to them in different languages in loud voices or on loudspeakers. There was virtually no chance for us to be on our own with our guide. 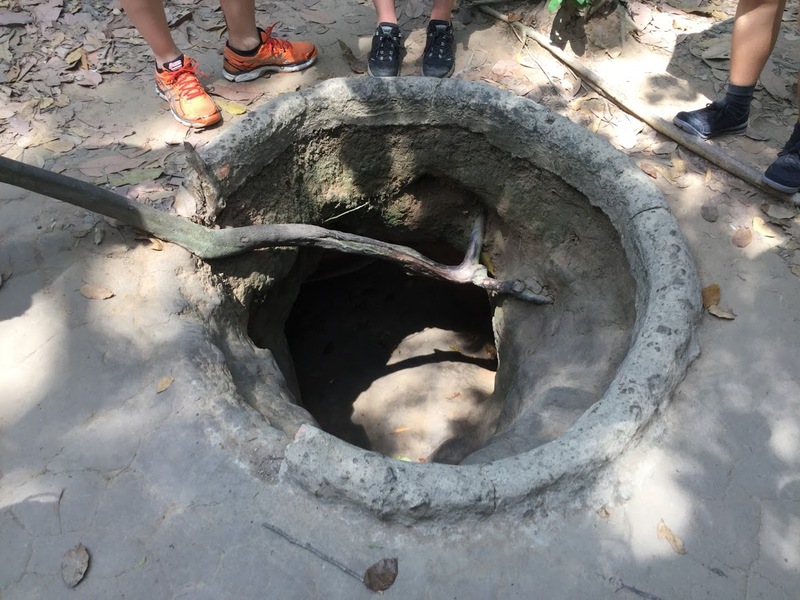 We saw some of the tunnel openings and learned how the Viet Cong brought air and water into the tunnels and hid the smoke from the kitchens. We also saw samples of the traps the Viet Cong set to catch and kill US and Vietnamese enemy soldiers. 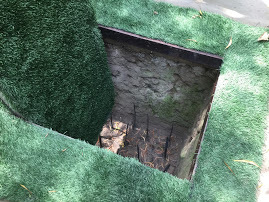 The traps had previously been used to catch large animals such as tigers and bears. The entire scene was far removed from what Priscilla remembered on her visit here several years ago and we learned that this new location was opened in 2000. Unfortunately, it has taken on a Disney type atmosphere with one of the “attractions” allowing visitors to pay extra to shoot AK47 guns. Those who wish can go into tunnels – which have been enlarged and fortified for tourism – and Bill did this. He had to crawl on his hands and knees and even then his back scraped the roof. Priscilla chose to sit this one out! We feel it’s important to see the tunnels since they played such an integral role in the war but we were not enthusiastic about our experience. 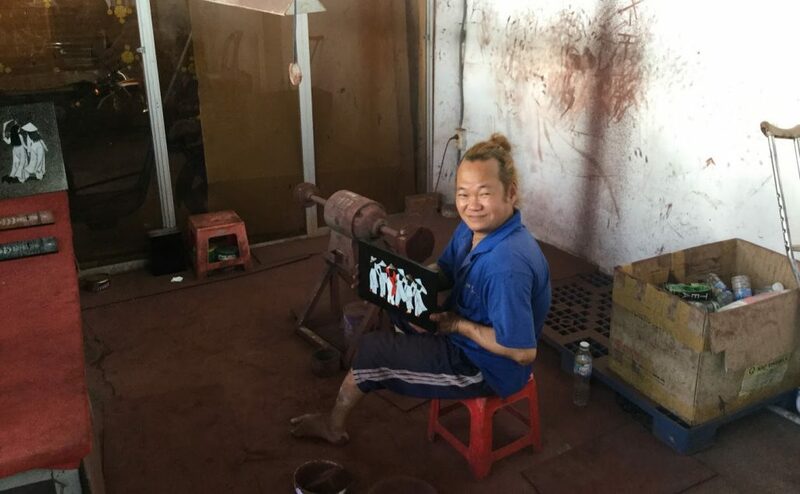 Our tour, like most others, included a stop at a Lacquer Factory on the way to the Cu Chi Tunnels. A guide explained the process which entails working with egg shell and mother of pearl to create intricate, beautiful pieces. At this ‘factory’ the items were being hand made by individuals injured during the war by Agent Orange, cluster bombs and landmines. The way out, of course, was through the shop where we were followed closely by a very aggressive sales lady who changed from being sweet and polite to hostile when she realized we were not big spenders! Some of the bigger pieces go for thousands of dollars which, of course, “Madam, can be shipped anywhere in the world at very little cost” ! A friendly welcome awaited us when we returned to our comfortable home in the afternoon. Next time we’ll share with you our unexpected life in the alleys of Ho Chi Minh City. 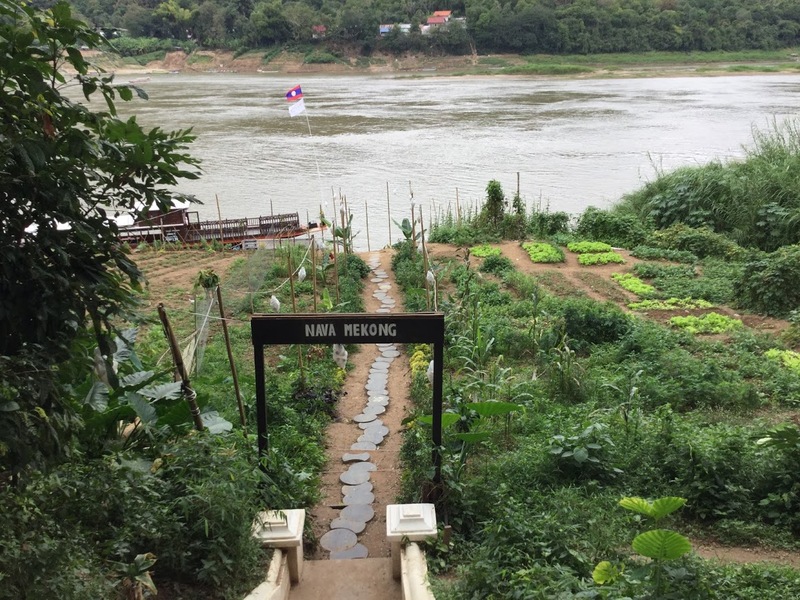 Most of our sightseeing centered around the town of Luang Prabang although we definitely wanted to enjoy time on the Mekong River. 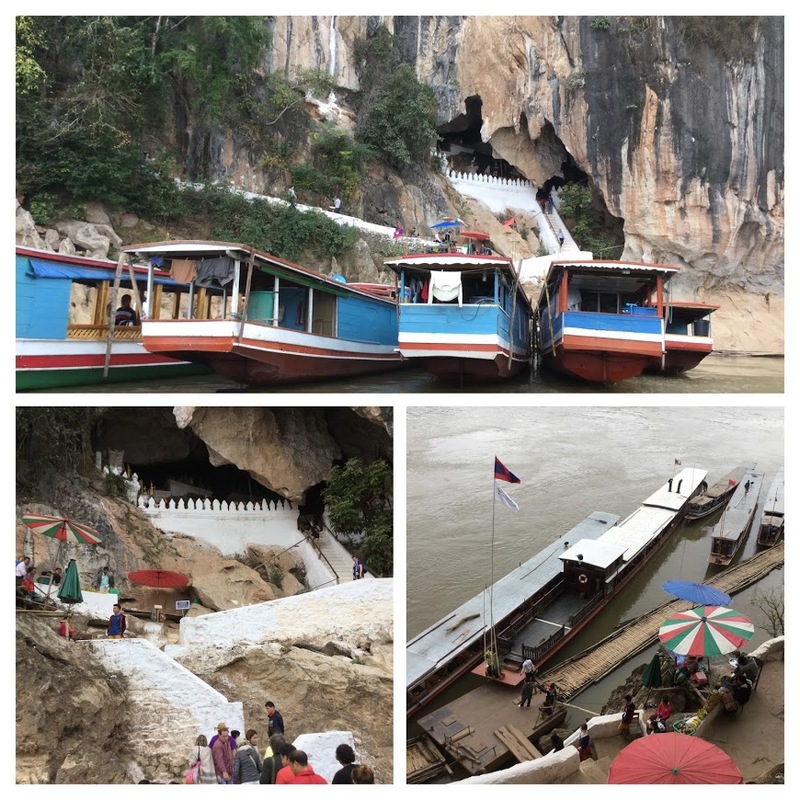 We decided to take a luncheon cruise to the Pak Ou Caves the next day because it was expected to rain for the rest of the week. We dressed warmly and were at the boat dock in time for a 10:00am departure. The cruise we chose was on the Nava Mekong boat which had good reviews on TripAdvisor. We were not disappointed. The staff was very attentive and the Tour Guide, a young Frenchman, spoke excellent English and was very knowledgeable. We cruised upriver for just over an hour and stopped at “The Whisky Village”! As the name indicates, local whisky is distilled here and we had a small taste of two different types of whisky. Both of them tasted like bad Moonshine and we decided to pass on buying a bottle! We continued on a walk through the village where women were weaving traditional Lao fabrics. To reach the village we walked across a “gangway” from the boat to the shore then walked up a fairly steep muddy slope to the village. This would not be easy for anyone with problems walking. Re-boarding the boat, we continued upriver to the Pakou Caves. Dating back thousands of years this is one of the most respected holy sites in Laos, filled with hundreds of Buddha statues of all sizes. The highlight of the day for us was the journey up and down the Mekong River, taking in the scenery along the Banks. We passed villages, water buffaloes and cows grazing in the fields and a couple of elephants at work. The people farm along the banks of the River at this time of year. During the rains the river floods and deposits rich silt along the banks which is perfect for growing vegetables and herbs. Our return trip passed swiftly as we enjoyed a delicious lunch and chatted with our table companion, a young woman from Venice, Italy. We’ve now added yet another destination to our Bucket List! Just around the corner from our guesthouse was the Royal Palace Museum and we managed to visit it in between rain showers. Set in beautifully landscaped grounds the Palace was built between 1904 and 1909 and was lived in by King Sisavang Vong and his family until the Communist takeover in 1975 when the Royal Family was sent to “Reeducation Camps”. The building was turned into a museum in 1995 and has been well preserved. Unfortunately, no photography is allowed inside the Museum and there are no pictures to showcase the exquisite mirrored walls of the throne room or the Reception Room decorated with murals depicting everyday life in Laos in the 1930’s. Among the gifts from various countries was a piece of moonrock from the United States. Bill was really looking forward to seeing the Royal Car Collection but what we found was a few old, dirty cars stuck in an outbuilding! A Citroen; and a few Lincolns given to the King by the US. No care has been given to these cars since the King was overthrown. Definitely disappointing to a car buff! For those who love Markets, Luang Prabang is hard to beat! If food is your thing, visit the Morning Market where the local people buy their produce each morning. You’ll find everything you can imagine … and some, frankly, you don’t even want to imagine! Many of the stalls sell exactly the same produce, all laid out on mats on the ground. Fruit, vegetables and herbs, chilies and eggs side by side with fish (dead and alive), buckets of live frogs, some snakes, pigs feet …. it’s all there, along with the smells! 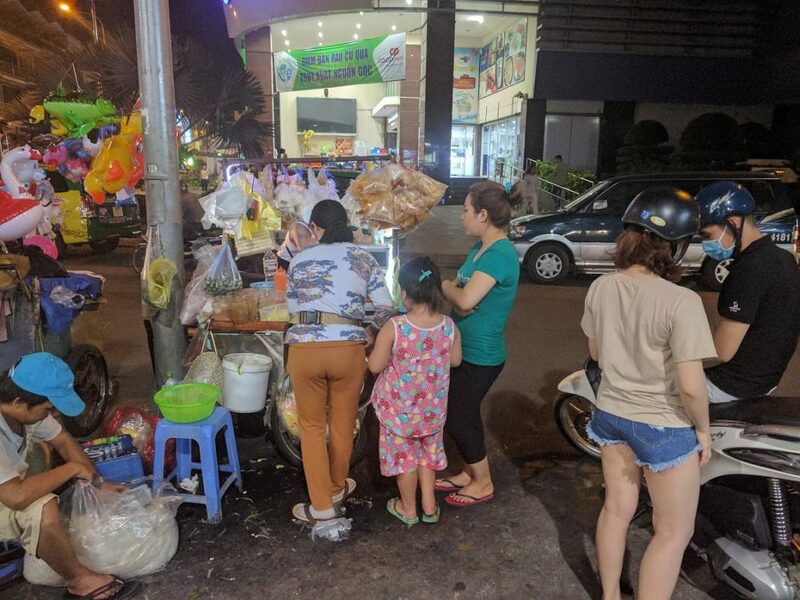 Around town there are several other day markets selling Lao silk, paper items and locally made handicrafts made by the Hmong people, but the most important daily event is the “Night Market”. Half of the main street in town is closed to traffic and hundreds of venders set up their stalls on the sidewalk as well as in the street, most of them selling the same items! We soon found it all too overwhelming and left it to other tourists to fight their way through the crowds and try to figure out the best deal. 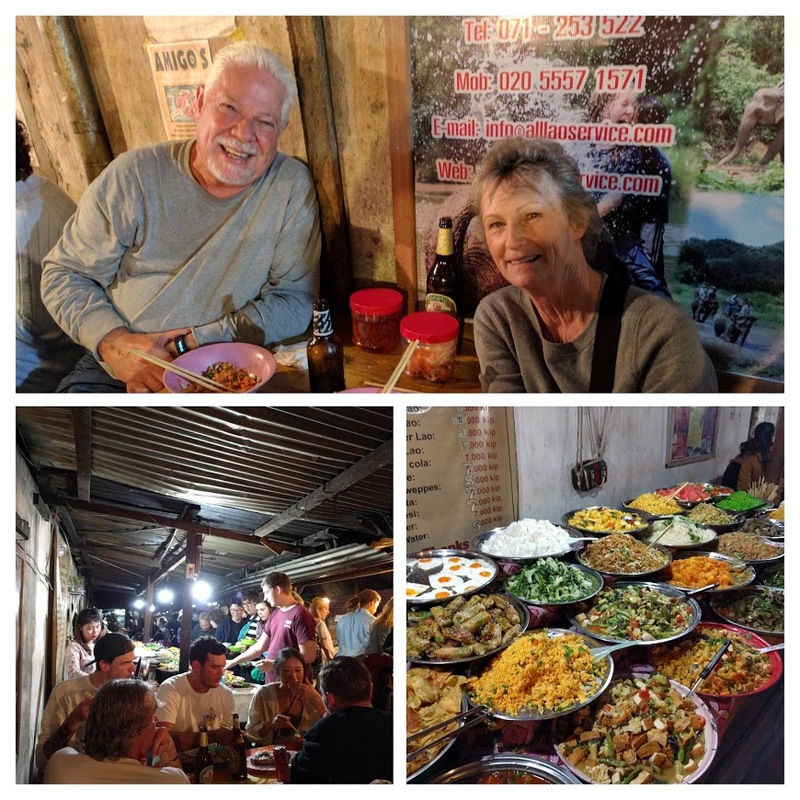 We did venture down a narrow lane from the Night Market to have dinner one night. Along one side of the lane are tables filled with large serving platters of food – noodles, rice, vegetables, meat, sausages, curries and more. Each vendor tries to attract your attention and get you to buy from them! When you’ve decided, you’re handed a plate and you help yourself to as much food as you want (or can fit onto the plate!). The vendor then heats it in a wok, finds you a table and you sit back and enjoy the chaos! All this … food, entertainment and meeting new people at your table – for $2.00! You just can’t beat it! There are many beautiful temples in Luang Prabang and it’s difficult to imagine a more spectacular one than Wat Xiengthong. Located at the confluence of the Mekong and Nam Khan Rivers it acts as the gateway to Luang Prabang and was the temple used for the coronation of Lao Kings. The mosaics throughout the temple are exquisite, particularly the Tree of Life mosaic. Remodeling in the 1960’s brought the temple back to its former glory and it is well worth a visit. Just down the street from our guesthouse was Wat Mai Suwannaphumaham, one of the few monasteries unharmed when a mercenary army from China known as the Black Flag Army, looted Luang Prabang and destroyed many ancient Buddha images in 1887. One day we happened to walk past when drummers were performing on the verandah. What a treat! 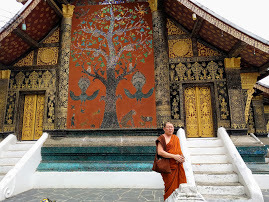 And so our visit to Luang Prabang came to an end way too soon! Looking back, we feel we should have spent more than ten days enjoying this special town but then we feel the same way about every place we visit! We’ll be heading south the Vientiane, the capital of Laos next!